If you’re a fan of old school tattoo art but either not sure if you’re ready for a tattoo or don’t have any more real estate left then you might like these pieces of tattoo jewelry. Each piece draws inspiration from old school tattoo designs with staples like swallows, nautical stars, sacred hearts and sugar skulls. Orangyred Ink pendants are kind of like having small removable chest pieces. 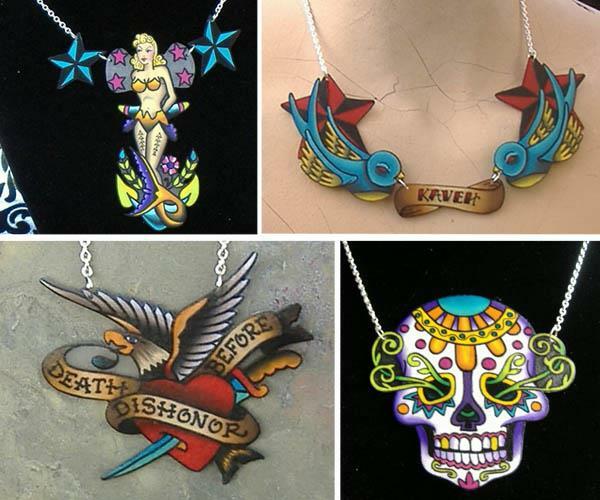 Check out the full collection of tattoo jewelry at the Orangyred Ink etsy shop. Sign-up above now to receive the latest tattoo designs and exclusive deals for tattoo artists along with tattoo gifts and supplies.